Bones Books & Bell Jars offers a contemporary fusion of art and medicine, recalling an era when artists and physicians collaborated to educate aspiring medical students and share information with other medical practitioners. 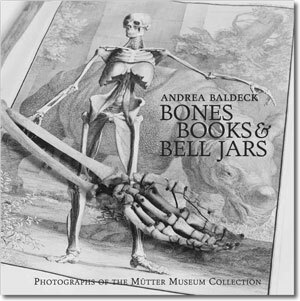 Andrea Baldeck was given free rein to mine Philadelphia’s Mütter Museum’s vast collection of pathological specimens, anatomical models, surgical instruments, illustrated textbooks and other 19th century artifacts, to create her “cabinet of wonders” inspired still life photographs. Baldeck wends her way with a sense of wonderment through the off-limit hallways and cabinets closed to the public. She shares her own aesthetic pleasure from a uniquely informed perspective: two decades earlier she left the operating room and a career as an internist and anesthesiologist, to enter the darkroom as a photographer. On a busy city corner rises an imposing building of brick and sandstone, designed with symmetrically balanced tall windows, classical finials, and thick oak doors that open into a spacious vestibule of polished marble. Erected in 1908, it is home to The College of Physicians of Philadelphia, the oldest professional medical society in the country, founded in 1787, the year the constitution of a very young nation was adopted. Twenty-four physicians, with the desire to "advance the science of medicine and lessen human misery," created a forum for regular meetings and discussion, for comparing clinical techniques and results of what was then called the "Practice of Physick." They encouraged collecting and publishing medical observations and inquiries on health-related topics, and established a medical library, begun with donations by the founding members and enlarged with gifts and acquisitions to the present day. Philadelphia, home to the first hospital in the colonies and the first medical school in the young republic, early gained prominence as a center for medical practice and education. What was "cutting edge" in the field two hundred years ago seems light-years removed from contemporary experience, which depends on rapidly evolving technology and digital transfer of information. In the late 18th and early 19th century, students learned from lectures and textbooks, with little or no hands-on experience in clinics. Cadavers for anatomy classes were often in short supply and, without chemical preservation, lasted only days in the laboratory. Microscopes, individually crafted, could easily exceed a student's budget. Medical imaging, prior to photography or X-rays, consisted of engravings and drawings, the collaborative work of physicians and artists, collected in costly leather-bound volumes. The College's medical library became a valuable resource for practicing physicians and those in training. Alongside it grew a collection of study aids in the form of pathologic specimens, begun in 1849 with contributions from member physicians. The legacy of the talented, colorful Dr. Thomas Dent Mütter (1811-1859), one of the pioneers of American plastic and reconstructive surgery, significantly enlarged these holdings in 1858. Like many of his physician colleagues in early 19th century America, he traveled to Europe for further study after graduation from medical school. The most advanced scholarship and research could be found in the great capitals — Paris, Berlin, London — as well as the most sophisticated tools for practice and instruction. During his year in Paris, Mütter sought out renowned professors, observing their technique in office and operating theater. He had access to finely crafted surgical instruments, exquisitely printed textbooks, and the latest in teaching aids. Among these were anatomical models fashioned of the materials of the time: wax and plaster, wood and papier-maché, porcelain and glass. Most likely a trove of these accompanied him home to Philadelphia and a professorship of surgery, where he gained a reputation for his compelling lectures, illustrated with his personal collection of diagrams, specimens and models. His practice pioneered treatment of congenital anomalies such as clubfoot, cleft lip and palate, as well as the repair of mutilating injuries, and he distinguished himself by being the first physician in Philadelphia to demonstrate the anesthetic use of ether in 1846, just one month after it had been introduced in Boston. At the end of a career shortened by illness, he gave his extensive collection of medical specimens and artifacts to the College, with the proviso that a dedicated fireproof structure be built for its display. These singular objects, intended for classroom instruction, share kinship with a much older concept, the Renaissance "cabinet of wonders," which arose in the late 15th century as intellectuals amassed books, botanical and zoological specimens (and occasional mummified anatomic studies) to feed their curiosity about the natural world. This urge to explain and illuminate, to explore and illustrate the latest developments in medicine, no doubt fueled Dr. Mütter's instinct to collect. Thus began the museum that bears his name, which continues to grow with gifts and acquisitions that range from articulated skeletons to iron lungs, birthing chairs to X-ray tubes. Like most museums, the Mütter displays only a fraction of its extensive holdings at one time, with the larger portion cached in storage. Behind the scenes at the College, in locked rooms ranging from basement to attic, dwell a trove of artifacts, specimens and texts. To gain access to this is a singular privilege, a journey through time and across a continuum of the healing arts. In the presence of bones, books, jarred specimens, instruments and texts, one becomes aware of the lives of caregivers and patients who learned from, and received attention, in the intimate contract of the doctor-patient relationship. What follows is an experiential account of what it feels like to spend hours in those rooms, in the presence of a remarkable collection, keeping company with the past. It is time spent alone, selecting books and objects to produce still life photographs that reflect on the roles of art and science in documenting the history of medicine. The images provide not a linear account of that history, but a prismatic view, illuminating aspects of treatment, inquiry and exploration undertaken by physicians and patients seeking to understand disease and banish pain. They are intended to engage the eye, stimulate the imagination, provoke thoughts and questions, and remind us that the quest to "advance the science of medicine and lessen human misery" is as apt and compelling now as when The College of Physicians was chartered in 1787. The idea of exploration conjures up visions of travel far afield, of oceans sailed and continents crossed, of new challenges to the senses, of unexpected detours and moments of surprise. Not all such adventures require a long geographic journey: some occur close to home, where distance is measured in time rather than miles, and discovery comes from delving into the past. Such a trip took me behind the scenes at The College of Physicians of Philadelphia, from below stairs to attic eaves, seeking treasures in its library stacks and museum storage. Medical training and a photographer's sensibility directed my steps and gaze through the labyrinth of materia medica occupying cabinets and shelves. Bones, books and bell jars spoke wordlessly yet eloquently, history made visible and palpable. Anatomic atlases celebrated the skill of dissector and artist. Surgical instruments, melding design and utility, evoked the trained hands that wielded them. Arranged in still life photographs, these varied elements engage the viewer in visual dialogues about the nature of illness, suffering, and the healing arts. This imagery conjures up lives and eras beyond our reach, offering visual evidence of the course of medical progress since the founders of the College convened in 18th-century Philadelphia to pool their knowledge and resources. The very tangible evidence of this endeavor continues to captivate the eye, capture the imagination, and contribute to the current and future practice of medicine.